Klawatti Peak from the shoulder of Eldorado Peak. We skied the obvious line. Cascade pass is a mecca for those who wish to climb and when it comes to skiing, there's plenty to keep even the ambitious busy. Sky Sjue recently returned from a one day and three day jaunt to the summits of Eldorado and Buckner, both of which landed on a beautiful weekdays followed by weekends of dreary weather. My pallet was whetted. Two days of midweek splendor left me only one option, "Boss, I am going to take tomorrow off, ummkay?" My brother Josh and Sam Avaiusini found their options equally limited as did Justin Ashworth. Our team assembled, we agreed to meet in Seattle at Midnight. We managed to reach mile 18.5 on the Cascade River Road before a log blocked any further headway by car. It was 2:45am Several inches of snow lead the way to the trailhead, a mile and a half further up the road. I'd like to specify that I use the word trailhead loosely. With no bridge we searched for a convenient log, the convenient log offered both Sky and Sam an inconvenient dip into the river. As if that wasn't enough to wake us up, the proceeding schwack wiped the smiles off the dry-booted and put bark in all of our boots for good measure. On a good note, the trail soon discovered us and we obliged by continuing to tree line. The next thousand or more vertical was on wide open slopes. All of us but Sam and Sky found the way easy. Due to their weighty disposition and the thick crust, those of the light-footed clan left the heavy-footed wallowing in the obscenities of their billowing frustration (so who's the overweight desk jockey now, eh?). Skinng wasn't an option due to the steepness and ice but before long it was and we quickly continued to the base of the Eldorado Glacier. By that time, the alpenglow off Johannesburg reminded us that morning was here and a beautiful day would soon make a showing, and in fine style with enough sun to bake the snow to a perfect mush-like corn. Entering the Eldorado Glacier required a short descent. I pulled my skins off and looked for a way down the icy slope. With no gloves and a desire to test my ability, I soon found myself with a bloody hand and a bruised dignity. Justin was right behind given a lack of forethought decided to slide down and ended cut (much worse than I) when his hands touched the snow. Everyone else was uninjured. Too bad we didn't have gloves on. With two torn up hands, Justin decided to remain behind to lick his wounds. I continued (with duck tape work) on. Unbeknown to me his day was far from over, but we'll get to that later. 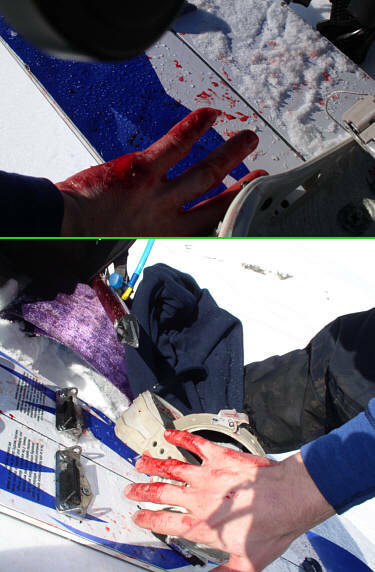 Justin's right and left hands after his fall. The skin up the Eldorado Glacier was awesome. The views made focusing an issue, but little did I know that the views were just beginning cause up next, the Inspiration Glacier, where the surrounding views are without a doubt, inspirational. Jason's pack on the Inspiration Glacier. In the background is Forbidden Peak. So inspired, our break only lasted as long as it took to take a sip of water. After my issue at the saddle, I had a bit of catching up in store. Sky and Josh were already working their way over to Klawatti, but Sam was patient enough to wait. Hidden lake peaks were behind us, Dorado Needle and Eldorado above, Forbidden and Buckner to the east. We were treading in god's country. The view into the midst of God's Country. The traverse to the base of the south face of Klawatti didn't take as long as appearance hinted. Sam climbed up to the rock and tried to salvage some drips to little avail. Sky and Josh started up first followed by Sam and I. There was a soft cover over ice and near the top no more than a few inches on top of rock. Once on the ridge it was just a quick hop and skip to the summit where it was time to sit. Now that was epic. With nothing to do other than look, we appreciated. Josh, Sam and Sky on the summit of Klawatti. We skied back down the route we climbed. The snow was nice buttery corn. Josh on the summit ridge. Sam skiing the south face with Eldorado in the background. Sam waiting his turn before skiing the South face. Josh making a turn on the southwest ridge with Forbidden in the background. Josh giving me the face. Josh going for the finish on Klawatti Peak. Sky was raring to rock and roll. His itch to hit Eldorado again kept him on the move, while the rest of us took a moment to get a drink and reminisce on a great ski. I set-off first to catch Sky and found snow that was sticky enough to allow me to climb and glide at the same time. The way back was much faster than there. I soon caught Sky and we made a rising traverse to the summit. We started fast and slowed as we neared the top. At the top, I finally had the chance to enjoy the exposed ridge. With a foot on one side and another on the opposite I set off to finish the last piece. What an airy view. We didn't spend long at the top before heading back down the monolithic ridge line. Near the edge we were able to find enough goods to make the climb worth the effort. Yells were hooted by all. Eldorado and it's east ridge. We skied along the shadow. We soon discovered that the Eldorado glacier was going to offer some very good skiing. With nearly a vertical mile left to go down, we were looking forward to every bit we could ski. With the sun still glaring down on the south aspects, we soon found plenty to keep us content. Josh heading off the Eldorado Ridge to access the Eldorado Glacier. Sky giving me a face full of the goods. He seems to have a habit of doing that. Josh finishing the glacier off. At the saddle, we didn't expect to see Justin who had decided to turn back earlier due to his hands. Turns out, he had lost his beacon and during his search had managed to fall into a small moat. We noticed blood at the bottom and our worry lead us to follow his tracks which fortunately continued to the car. Due to the very soft snow and the boulder nature of the terrain, there are plenty of moats to fall in and are in no way deadly, but inconvenient nonetheless. About that time Sky dropped his water bottle and watched it skip down the icy crust. "Time for some extra turns!" The next part was terrible for skiing. The sun had left and a very hard crust had materialized with a 1-2 foot soft layer underneath. We could barely turn at the top, but did manage to learn enough to muscle some styling turns in before the bottom. Once at the trail, we all headed for the bottom in a race against dark. It's no fun to schwack in the dark. In the fading light, I did manage to lose the trail at the bottom. When I reached the stream, I didn't even bother looking for a place to cross, I simply walked through the river, put on my skis at the road and skied to the car. When I arrived at the car, I didn't expect to see Justin. Turns out, when we had picked him up and driven him further up the snowy road, he'd left his keys in our car. As a result, he spent four or more hours waiting for our arrival. In the end, we all thought that this trip was a classic journey and a classic way to get a first impression of the cascades in general (okay, maybe not Justin). Inspiring views of the most wild parts of washington are witnessed from the summits of Eldorado and Klawatti. While access is demanding, anyone interested in exploring this area will have paid in sweat the cost of entry. Our sixteen or so hour journey left us with plenty to remember it by and I am sure we will all be back for reminders because this place is our mecca, our home away from home.